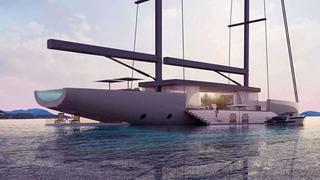 Designer Lujac Desautel has unveiled an unusual 55 metre sailing superyacht concept called Salt, with glass facades and hull sections that fold down to create luxurious water-level patios around the boat. With the two swimming platforms lowered on both sides of the yacht, Salt’s beam is doubled from 11 metres to 21 metres. Lucaj Desautel compares this to the beam of Hemisphere, the world’s largest privately owned catamaran, which has a beam of 16.6 metres. Salt’s central living space, essentially a large oblong area with glass facades, is inspired by the celebrated Glass House designed and lived in by modernist architect Philip Johnson in Connecticut in the 1950s. Desautel’s version of the Glass House is cradled between Salt’s two masts. The hull sections on both sides of the glass structure are cut away to create unobstructed views of the surrounding sea. In turn, the walls of the glass structure can slide open, creating a wonderful al fresco space with stairs running up to the fore and aft decks and down to both sides of the yacht. Even the stairs take inspiration from classic design and Desautel namechecks the extraordinary stepwell of Chand Baori near Bandikui, Rajasthan. The historically important site was built between 800 and 900AD and features a series of carved stone steps down the side of a huge well, to enable people to reach the water level, however high or low it was. “The world is a laboratory of ideas that can be borrowed,” the designer says on his website. In the sail plan, too, the designer looks to history for inspiration, this time turning to Japan in the 16th and 17th centuries. The red-seal ships, so-called because they carried a sealed permit from Japan’s ruler allowing them to engage in foreign trade, were ketch riggers utilising square sails. The Salt concept is a ketch that utilises fully battened wing-style square sails on its twin masts. With two stays forward of the mast, this gives the option, including a kite, of flying five sails in all when off the wind. Inside, guests will be accommodated in five cabins. There will also be three dining rooms, a 300 square metre swimming pool and room for two tenders on the foredeck. Lucaj Desautel hails from Oregon and is now based in San Francisco, California. He was nominated for the 2014 Boat International Young Designer of the Year award.